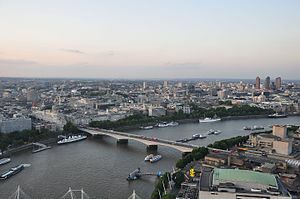 Waterloo Bridge is a road and foot traffic bridge crossing the River Thames in London, England between Blackfriars Bridge and Hungerford Bridge. The first bridge on the site was designed in 1809-10 by John Rennie for the Strand Bridge Company and opened in 1817 as a toll bridge. The granite bridge had nine arches, each of 120 feet (36.6 m) span, separated by double Grecian-Doric stone columns and was 2,456 feet (748.6 m) long, including approaches. Before its opening it was known as 'Strand Bridge'. During the 1840s the bridge gained a reputation as a popular place for suicide attempts. In 1844 Thomas Hood wrote the poem The Bridge of Sighs about the suicide of a prostitute there. Paintings of the bridge were created by the French Impressionist Claude Monet and English Impressionist, John Constable. The bridge was nationalised in 1878 and given to the Metropolitan Board of Works, who removed the toll from it. ↑ Ebeneezer Brewer (1970), Brewers Dictionary of Phrase and Fable Cassell. p.152. This page was last changed on 9 September 2015, at 11:14.